An Apocalypse battle report unlike any other! 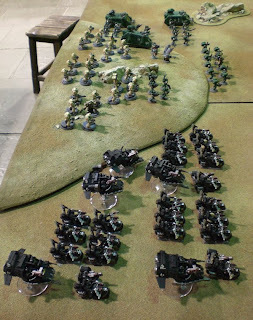 Apocalypse is the toughest 40K battle I've ever played and writing up this Apocalypse Battle Report was just a difficult following 6 turns of absolute carnage. To make things worse, it was only me and James playing. Normally a game of Warhammer 40K Apocalypse is a multi-player affair with two opposing teams, a healthy helping of strategy cards and a group effort to create the most destructive army possible and come up with a plan incredibly cunning. However, due to our friends having to work, being dragged off by girlfriends and family or simply forgetting altogether, just the two of us ended up playing Apocalypse. Fortunately, James would be fielding his entire Dark Angels army while I had borrowed two of my friends' Tau armies earlier in the week and then spent a whole evening creating a Tau Apocalypse army from our combined forces. This Apocalypse Battle Report is 4500 points per side, uses 1 strategem per team and lasts 6 turns. James is fielding 4500 points of Dark Angels, which is 1500 points of Ravenwing, 1500 points of Deathwing and 1500 points of regular Dark Angels. Meanwhile I took take my 1500 points of mechanised Tau as well as Simon's 1500 points Tau army of mixed units and Luke's 1500 points of static gun line Tau army. 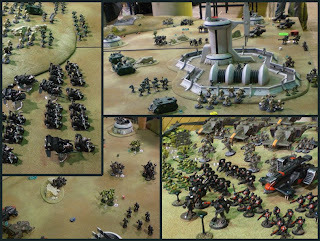 At the beginning of the game we ruled that any unit above half strength could claim an objective in a similar fashion to 4th edition Warhammer 40k. We were hazy on some of the Apocalypse rules as James was meant to have read up on this...but didn't. So we played on anyway and had a really good game! As for tactics -we had to make those up as we went along. But Apocalypse is an extremely tactical game and works much like a giant game of extreme Warhammer 40,000 with a much bigger board. I'll tell you what I mean by 'extreme' in the conclusion at the end. We started our game at 10am and finished at 4pm. We played straight through, stopping for drinks 3 times. It was a real marathon game which took approximately 1 hour per turn. A Tau training colony in an uninhabited system has been discovered by the Dark Angels space fortress monastry as it dropped out of the warp for routine maintenance checks. The Tau satellite defence network has caused irrepairable damage to 'The Rock' and now the Dark Angels seek vengeance against the aliens while seeking to acquire technologies which will help them to repair their engines and continue their pursuit of The Fallen. Despite attempted negotiations from the Tau water caste, the Dark Angels plan to attack at the enemy's command centre, seeking to end the conflict in one swift assault. There is no time to talk peace or to trade technologies and aid with the aliens due to the urgency of the Dark Angels primary mission. Having destroyed the Tau satellite network with return fire from the fortress monastry, the Dark Angels fleet began landing troops on the far side of the planet. A drop pod assault on the Tau command post is impossible due to the number of anti-aircraft emplacements while the building itself is protected from orbitabl bombardment by a powerful energy shield. As the Dark Angels mechanised company, led by Ravenwing outriders approach the Tau command post, Tau units are drawn from the training camps dotted across the globe to defend the colony's only form of communication with the rest of the Tau Empire. With the background out of the way, let's take a look at the Apocalypse armies we built for the conflict. We rolled the scatter dice for the Apocalypse deployment and drew a line to the nearest table edge from it, then drew a straight line from that point into the opposite diagonal corner. This created a fairly even divide across the board. Now comes bidding for setting up first and going first. I won the bid to go first, saying I could set up in 1 minute. James laughed until I revealed by Strategem -Careful Planning. Careful Planning would allow me to keep whatever I didn't place on the table into reserve. Half of my army would arrive on Turn 1 with the rest arriving on Turn 2. While some might say I should have chucked as much as possible on to the table to inflict as much damage as possible, I kept all but the 3 Broadside teams and 2 Hammerheads off the table because of the Ravenwing. In Apocalypse, units arriving from reserve can Deepstrike, Outflank or move on from the board edge and you don't have to declare which at the start of the battle. Couple Outflanking with the Scout move and the Ravenwing would be a very dangerous foe to face. So I had to effectively make James go first so I would know when and where his Ravenwing would arrive, while maximising as my railguns to take out his razorback transports on Turn 1. I chose the side of the table with the Tau base. Not only because it looked cool, but it would slow down James's army as they would have to drive around it or trudge through it. I expected the centre to fold as I pulled out and strategically reinforced my flanks, or one of the flanks -which is one of my common Tau tactics. Seeing little resistance, James deployed his Ravenwing as far forward as possible in the centre, supported by the assault squad and razorbacks while the Deathwing, 1 Ravenwing bike squad and Sammael were held in reserve. Meanwhile 2 combat squads with lascannons occupied the rocks to the left, the Devastators set up in an outpost on the right with the Scouts in the rocks forward of them on the right. James then moved his Ravenwing bikes 12" forward as part of their Scout move. I realised that one of the Tau Broadside teams may not be able to fall back quickly enough to escape their charge range. Unlike a game of Warhammer 40K, in Apocalypse you must place your objective markers AFTER both sides have set up. Each team gets 3 objectives to place. 1 in their own deployment zone, 1 in no man's land and 1 in the enemy deployment zone. 1)James won the roll and placed his first objective in the no-man's land on the right side of the board, in the rocks, next to his Scouts. 2)I placed a counter on the right in his deployment zone, approximately 13" away from the objective held by the Scouts. 6)I placed a counter on the left, behind the combat squads in the rocks, tucked around the side of an outpost building. This created an objective in the centre of my deployment zone. 3 objectives on the right flank. 2 objectives on the left flank. The centre would fold and the Tau would go down the flanks. I think James realised this, but also realised that he couldn't divide his army or send all of it towards one of the flanks as my units could arrive from reserve and counter his tactics. I planned to provide some resistance in the centre to draw him in, create 1 strong flank and make a sneaky attack on the left flank in a bid to contest some objectives. But the right flank had to hold! Due to the 'Careful Planning' stratagem, 11 of my units arrived on the first turn. Seizing the moment to 'do something cool' and strategically claim the right flank and crush and counter tactics, I announced that I would Deepstrike ALL my Tau Battlesuit teams, as well as 2 of the Stealth Suit teams. They all landed without a hitch in a spread out formation to dissuade James from doing the same in the following turn with his Deathwing. The chance of the elite space marine terminators scattering on to the units was too risky! Meanwhile 2 Hammerheads and 2 Skyray arrived from the right flank board edge. The Skyrays targeted the scouts in the rocks with their markerlights, which were blasted apart by the nearby Stealth Suits thanks to the increase in Ballistic Skill and reduced cover saves. Meanwhile the Tau Battlesuits fired en masse at the Devastators in the outpost, wiping them out before their missile launchers could take a heavy toll on any Battlesuit teams. The Tau Broadsides made a strategic withdrawal from the Tau base, but 1 team, which was too far forward to escape the Ravenwing bike squad moved forward 6" instead and on to the objective! Combined fire from the 4 Hammerheads and 3 Broadside Battlesuit teams destroyed a Razorback, immobilised the other 2 Razorbacks and blew the twin linked heavy bolter turret apart while 2 Ravenwing Landspeeders came crashing to the ground in a fiery conflagration. The Tau had secured the right flank for the time being and bought themselves some extra time in eliminating all 3 space marine transports. James began by advancing one of the Ravenwing bike squads into the Tau base. They opened fire on the Broadsides on the objective, hitting and wounding with 4 bolters and 2 melta guns. I declared I would take the melta guns on the Broadsides, then removed the entire squad. Why? Because I didn't want the bikes getting the extra 6" from a successful charge, plus whatever else for winning and wiping out the enemy in close combat (and probably during my turn). Meanwhile, the attack bikes flanked the sides of the Tau base, targeting the other Broadside teams, but inflicting no damage. The combat squads on the left targeted the Hammerhead with their lascannons and destroyed it. 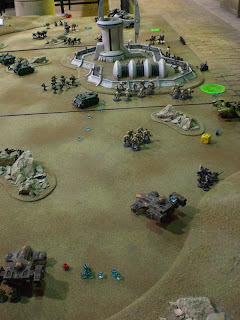 The combat squads inside the Razorbacks got out and began running towards the Tau base. The Assault Squad led by the Chaplain moved forward, following the Ravenwing bikers. The 3 remaining Land Speeders moved towards the right flank, firing upon the Tau Battlesuits but inflicting little damage. The second Ravenwing bike squad Turbo Boosted onto the right flank, towards the Tau Battlesuits. The lone scout sgt, having survived the torrent of fire poured into his squad heroically charged one of the Tau Battlesuit teams, inflicting a wound on the Shas'el, before being clumbed to the ground by heavily armoured fists. James rolled for his Orbital Bombardment stratagem. It didn't arrive yet. 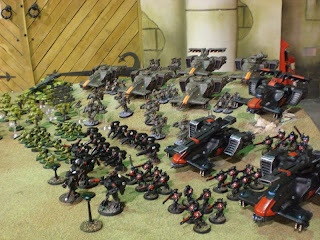 The Firewarrior teams lined up behind the Tau base, safe in the knowledge that they would be too far away to be charged by Ravenwing bikes or Ravenwing attack bikes. They couldn't fire this turn, but next turn would bring with it rapid firing pulse rifles supported by markerlight fire as the infantry squads optimised their roles. The Broadise teams continued to fall back. The team on the right destroyed the Ravenwing attack bike which had been pursuing them while the other failed to do the same. On the right flank, markerlights from the Skyrays targeted the Turbo Boosting Ravenwing bike squadron as the Tau Battlesuits closed in. Torrents of plasma, missiles and frenzied last minute spraying from the Stealth Suits and they were gone. Meanwhile the Hammerheads targeted the Ravenwing Land Speeders, blowing the assault cannon off 1 and stunning another. On the left flank, 3 Devilfish arrived and opened fire on the combat squads with lascannons hiding in the rocks. Their combined fire killed 1 space marine. The last 4 Stealth Suits Deepstriked in behind the outpost at the back, running to the objective and the safety of cover. This turn half of the Dark Angels reinforcements would arrive. It was also at this point that James's bad habit of mixing his Reserves and 'Dead Pile' into one big mass would be my downfall. But hey, these things happen. The Ravenwing bike squad which had been kept in reserve Outflanked and came on from the right flank, charging one of the Tau Battlesuit team (the regular one, not any of the HQ teams). With them mixed in with his dead, I'd completely forgotten about them. To the left of the Tau base, 2 Deathwing squads used the nearby Ravenwing Attack Bikes teleport homers to Deepstrike without scattering. They opened fire on the nearby Tau Firewarriors, inflicting a mixture of losses. One of the Attack Bikes killed a drone on the Broadside team. Meanwhile the Ravenwing bike squadron advanced and killed 4 Tau Firewarriors in the centre. The Ravenwing Attack bike on the left sped away from the Tau base to fire at the nearest Tau Devilfish, but missed. The combat squads in the rocks targeted the other with their lascannons, either missing or the shot being dissipated by the tank's Disruption pods. The Assault squad moved away from the Tau Base and towards the left flank should it need reinforcing. Besides, all those plasma rifles, missile pods and railguns didn't look very friendly. James rolled for his Orbital Bomardment. It didn't arrive. On the right flank the Tau Battlesuit Command team fought a tough battle with the Ravenwing bikers, each inflicting an equal number of wounds, but with one of the shield drones gone, the Ravenwing bikers would have the upper hand in the next round. Seeing that the Tau Battlesuits were doomed to lose the combat during my own turn, I charged in the nearby Stealth Suit team to attempt to tip the balance. Although little happened in this round of combat. Meanwhile the rest of the Tau Battlesuits destroyed the remaining three Landspeeders while the Skyrays, Hammerheads and Broadsides, combined with the advancing wall of Tau Firewarriors wiped out the Ravenwing Bikes in the middle of the Tau base. On the left, the Tau Devilfish continued their advance, opening fire on the nearest combat squad in the rocks. The 4 Stealth Suits did the same, wiping out the rest of the squad between them. The broken Firewarrior team continued to fall back, firing their pulse rifles at the Ravenwing Attack Bike as they retreated. James was finally able to call down his Orbital Bombardment and promptly wiped out an entire Tau Battlesuit Command Team which was claiming an objective with it. I don't think he realised how effective it would be, otherwise it would have been placed on the Black Tau Battlesuit Command team with the additional Shas'O leading it. In the battle for the Tau base, the Deathwing terminator squad led by the Librarian teleported in using the teleport homer from the nearby Ravenwing attack bike before casting Hellfire and incinerating several Fire Warriors from the three closely huddled squads. The other Deathwing terminator squads ponderously advanced, being slowed by the walls of the Tau base, but that didn't stop them from gunning down more of the Firewarriors. Meanwhile the Ravenwing Attack Bike charged the Tau Broadsides, to no effect. The Assault squad, led by the Chaplain moved back towards the centre of the board, towards the Tau base. A Deathwing terminator squad led by Grand Master Belial Deep Striked on to the left flank, besides the Attack Bike, before opening fire on a Devilfish and immobilising it. Meanwhile the Attack Bike blew up another with its multimelta before charging the 3 surviving Fire Warriors who bundled out of the side hatch and got to their feet. The remaining combat squad in the rocks loosed a Lascannon shot at the remaining mobile Devilfish, but the shot was saved by its Distruption Pod. Sammael, Grand Master of the Ravenwing, also arrived in his Land Speeder, Deep Striking on to the board and scattering wildly to the right hand side of the outpost of the left flank...while the 4 Stealth Suits cowered behind the other side for the time being. On the right flank, the final Deathwing terminator squad used the teleport homer of the Ravewing bike squad who were in close combat to land beside them before opening fire on the nearest Tau Battlesuit Command team, killing both drones and both bodyguards! However, the Shas'el passed his leadership test. The close combat between the Battlesuits, Stealth Suits and Ravenwing bikers wasn't going well for the Tau. The Ravenwing sgt with his power sword was making all the difference and the Tau were slowly loosing. On the right flank, the newly arrived Deathwing terminator squad were surrounded by Tau Battlesuits who opened fire with the plasma rifles and missile pods, backed up by solid railgun slugs from the advancing wall of Hammerheads, wiping out the squad in a horrendous volley of superior firepower. The Tau Skyrays targeted the Space Marine combat squad in the rocks, between 2 immobilised Razorbacks in the centre, but only 1 was in range and scored a hit with its markerlight, which was used to boost the Ballistic Skill of the nearby Tau Stealth Suit team. They opened fired with an accurate volley, but were only able to fell 2 Space Marines. Meanwhile, the close combat with the Ravenwing, Battlesuits and Stealth Suits raged. Both sides sustained casualties. When the dust cleared, 3 Ravenwing bikers remained, including the sgt brandishing his deadly power weapon. The Tau Battlesuit team had been wiped out, while the Stealth Suits had broken and fled, using their jet packs to escape the pursuing Space Marine bikes. 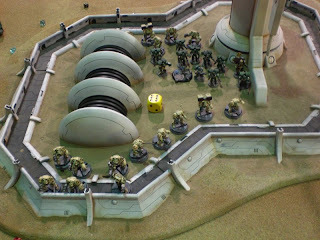 In the centre, the Tau Firewarrior teams advanced to the wall of the Tau base, rapid firing their pulse rifles at the Space Marine combat squad which had run into the centre. Combined with firepower from the Broadside team, they killed 3 of the 5 Space Marines. The combat continued between the Ravenwing Attack Bike and the other Broadside Battlesuit team with the Ravenwing Attack Bike scoring a lucky wound. The Broadsides promptly failed their Leadership test and were overrun and destroyed. On the left flank, the remaining Tau Devilfish continued its advance. 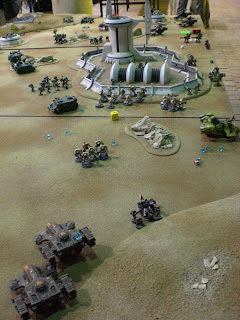 The immobilised Devifish kept the embarked Firewarriors safely inside and with the nearby Stealth Suits opened fired on the remaining Space Marine combat squad in the cover of the rocks, reducing the squad to 3 models. Meanwhile the combat continued between the 3 Tau Firewarriors and the Space Marine attack bike with no wounds scored. On the left flank, Sammael swept around the outpost building and fired at the Tau Stealth Suits, killing 3 of them and breaking the squad. They then fled into the open, towards the nearby Tau Devilfish. The Deathwing terminators fired at the mobile Devilfish, to no effect as the Assault Cannon rounds pattered harmlessly off its hull. The Space Marine Combat Squad fired their lascannon at the Tau Devilfish and missed. 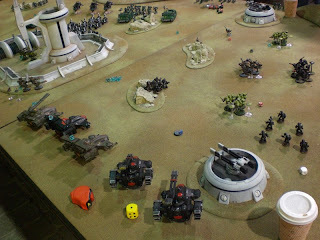 The close combat between the 3 Tau Firewarriors and the Space Marine attack bike with no hits scored by either side. 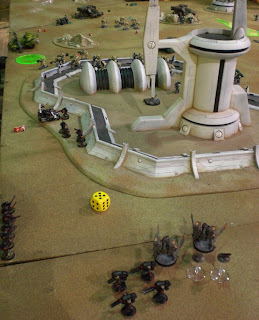 In the centre, the Assault squad advanced to the edge of the Tau base once again. The Ravenwing Attack bike charged one of the Tau Firewarrior teams, killing a handful of the troops in close combat, but they held their ground and fought on. The Deathwing terminators advanced en masse, led by the Librarian and between them cut down over a dozen Tau Firewarriors with their stormbolters and cyclone missile launchers. On the right flank, the Stealth Suits were spotted by the Space Marine Combat Squad in the centre and lost one of their numbers to a lascannon and another to the twin linked heavy bolter of an immobilised Razorback. The Stealth team failed their morale check and fell back 16" towards the table edge. Meanwhile, the 3 Ravenwing bikes charged the nearest Tau Battlesuit Command Team, inflicting a wound on the Shas'el and one of his bodyguards while losing two of their number in the process. The Ravenwing sgt then passed his armour save for being fearless. The Stealth Suits which had been spotted continued to flee, as did the Stealth Suits beaten in close combat. Fortunately neither fled off the board. On the right flank, the Black Tau Battlesuit Command team with Shas'O turned their attention to the Combat Squad in the rocks with the very accurate lascannon, but could only kill a single Space Marine as their plasma rifles were out of range and their missile pods scored few hits. The lone Tau Battlesuit Shas'el joined the other Tau Battlesuit Command Team in close combat with the lone Ravenwing sgt, but the sgt refused to fail any of this 6 armour saves while inflicting more wounds on the gathered Tau Battlesuits. Fortunately, they held their ground this turn. Despite 'going to ground' the remaining Space Marines in the centre which were desperately holding the Tau base objective were blasted apart by railguns from the nearby Broadside team, thanks to some help from the nearby Skyray's markerlights. The combat continues between the Ravenwing Attack Bike and the Tau Firewarriors with each side causing a single wound. The Dark Angels assault squad were then bombarded by submunition rounds from the Hammerhead railguns. All but one shot scattered wildly, killing only 2 of the Space Marines while the Chaplain sustained a wound to save one of his men. On the left flank, the immobilised Devilfish threw its hatches open and the Tau Firewarrior squad disembarked and rapid fired the Deathwing terminator squad, but their shots pattered harmlessly off their thick tactical dreadnought armour. Their Devilfish fired at the Combat Squad in the rocks while the other Devilfish advanced, the Tau Firewarriors within disembarked and also rapid fired as well as some additional shots from the remaining Stealth Suits as they rallied. 42 shots later and not a single Space Marine had fallen! The Ravenwing bike and 3 Tau Firewarriors continued their combat with 1 Tau Firewarrior being killed, but the squad held their ground and fought on. On the left flank, the Deathwing terminators, led by Belial advanced towards the Devilfish behind the rocks, while firing their storm bolters and assault cannon at the remaining Stealth Suits, wiping them out. The 3 Space Marines in the rocks charged the Tau Firewarriors, killing 2 of them, but the Firewarriors held their ground and the combat continued. Sammael in his Land Speeder shot the Tau Devilfish in the rear, but was only able to disable the tank's smart missile systems. The Ravenwing Attack Bike finally killed the Tau Firewarriors and consolidated towards the squad which had disembarked from their immobilised Devilfish. 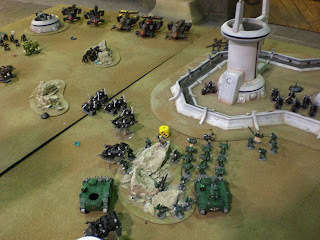 In the centre, the Aassault Squad led by the Chaplain used their jump packs to leap over the wall and into the Tau base. The Deathwing continued to slowly advance, delayed by having to climb the wall of the Tau base, even when attempting to run. The Ravenwing Attack Bike killed the last Tau Firewarrior it was in close combat with and consolidated towards the next squad. On the right flank, the Ravenwing sgt continued to hold his own against the 4 Tau Battlesuits and 2 shield drones bearing down on him. The combat ended a draw with no casualties suffered by either side. With the Deathwing and Assault squad advancing, the centre was lost, but I had planned for that. My Firewarriors couldn't be charged by the Dark Angels, so they busied themselves with gunning down the Ravenwing Attack Bike. On the right flank everything was out of range of the enemy or unable to get into combat with that blasted Ravenwingb sgt who merrily continued to swing his power sword wildly, wounding one of the Tau Battlesuits, but they continued to hold their ground. The Hammerheads and Skyray were too far away to do much, so I moved them all to claim objectives. On the left flank, the Tau Firewarriors were clearly doomed. The Space Marine Combat should 'should' have died to the massed firepower poured into them, but typically James had passed all his saves, leaving me in trouble. The Devilfish continued to move forward, over 6", but within 6" of the objective to contest. Let's hope it could survive! Meanwhile the 3 Space Marines made short work of the remaining Firewarriors while the other squad of Firewarriors rapid fired at the Ravenwing Attack Bike, along with their immobilised transport, killing it. In the centre, the Assault squad and Deathwing squads claimed the centre, gunning down Firewarrior squads as they advanced. On the right flank the Ravenwing sgt fought on and the combat came to another draw with no casualties suffered by either side. On the left flank the Deathwing terminators advanced, firing their assault cannon at the Tau Devilfish contesting the objective in the rocks, but to no effect. Meanwhile Sammael zoomed across the board to claim the objective behind the outpost and could not fire this turn. It was down to the Space Marine Combat Squad who turned their lascannon to face the zenos tank it. The skimmer exploded as the lascannon hit home, showering debris over the Space Marines who resolutely held the objective. The game concluded as a draw with James claiming the left flank objectives and the centre objective, while I claimed the three on the right. Apocalypse games are hard work! We played for 6 hours with a couple of 5 minute coffee breaks and the occasional chat with people who happened to be at Warhammer World for the day. That's 1 hour per turn! Now, I'm sure we didn't play the Apocalypse game to the letter. I'm certain Apocalypse is only meant to last for 4 turns and as far as Apocalypse games could go, ours was very close despite a mistake or two on both our parts. Despite allowing myself to be charged by an outflanking Ravenwing bike squadron on the left flank, pretty much everything went to plan. Well, apart from the 3 Space Marines in the rocks passing all their armour saves (when they should have failed 2), which really scuppered my left flank sneaky strategy. I don't feel that Tau is an army very well suited to Apocalypse games. They're neither fast nor forgiving to play and James proved just how versatile his Dark Angels could be when combining the staying power of the Deathwing with the speed and unpredictable deployment of the Ravenwing. In fact, it's the ability of Reserves to outflank, deepstrike or simply arrive from the board edge which put the Tau at a distinct disadvantage. This led to my choosing 'Careful Planning' as my stratagem to prevent outflanking Ravenwing from herding my slower army into a solid line of Deathwing terminators and Dark Angels deployed along the No Man's Land. Caught between the hammer and anvil, my forces would have been crushed. So the tried and tested Tau tactic of putting everything into reserve served me well. Had James employed a similar tactic I would have been free to counter his units from a distance. Or effectively 'play chess' with the arrival of his outflanking units and my Tau Battlesuit reinforcements. James and I had a lot of Ifs, Buts and Maybes after this game and we both had a suitable counter in mind for whatever tactics the other player was to reveal. However, I learned a lot from this Apocalypse scale game of Warhammer 40K with regards to my Broadside and Battlesuit units and taking casualties. This started by taking the two melta gun hits on the Broadsides occupying the Tau base on Turn 1, which caused the unit to be wiped out, denying James the extra distance from charging and sweeping advance from the likely victory in close combat. Similarly, on the right flank, later in the game, I could have taken 2 hits from the Ravenwing sgt's powersword on the Tau Battlesuit Shas'el, which would not only have killed him, but his 2 shield drones as well, forcing me to take a break test at -4 for a total of Leadership 4. The Tau Battlesuits would have certainly broken in the Dark Angels turn, leaving the remaining Ravenwing squadron out in the open for a dose of rapid firing plasma rifles from the surrounding Battlesuit teams. But with an epic battle hanging in the balance, I didn't feel I could take that risk. Maybe next time though? For me, the real stars of this game were the Ravenwing bikes and the Tau Battlesuits. On Turn 1 I just had this brilliant and crazy idea of Deep Striking ALL the Tau Battlesuits on to the board in formation -simply because it would look cool! Meanwhile, Ravenwing bikers are one of the most powerful and versatile units in Apocalypse. Because of their Scout move, ability to Outflank, high toughness and high mobility as well as a plethora of melta guns and an attack bike with a multimelta to boot, they post a real headache -especially when they are ideally suited to reacting to enemy deployment. It is for these guys alone that I took the Careful Planning Stratagem. As for the Apocalypse Stratagems themselves, few really caught my attention, bear in mind I had only a few minutes to quickly skim the book and pick one. As I say, Careful Planning seemed very well suited to playing the Tau tactically rather than going for kills. Orbital Bombardment is quite fantastic against any unit out in the open. If I could have had more stratagems, I would have chosen this one simply because of how accurate and destructive it is -hence why James chose it. And it fitted in with his idea of a Space Marine assault. I hope you enjoyed this Apocalypse battle report. We had great fun playing our first Apocalypse game, but I think that next time I'll take a much more forgiving army, get more people involved and we'll definitely stop for lunch half way through. Pretty cool! Thanks for sharing. And great pics! Great battle report! Apocalypse is when I started my Tau army (the battle suit box set was an awesome buy!). 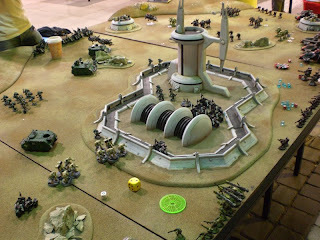 Also the Tau base is a good looking piece of terrain! I'm actually surprised you didn't take Flank March! Especially since you decided to put almost your entire army into reserve. 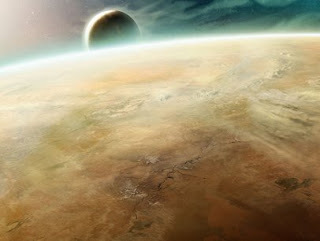 In our Apoc games, it is always the first objective taken. Bid a 30 minute deployment to virtually guarantee you get to go 2nd. (This is an objective-based game. You WANT to go 2nd!) Put most/all of your army into reserve. Then come onto the table almost anywhere you want! For a mechanized army like Tau, it's golden. I think you're too hard on the Tau. "More forgiving"? ;) Try and remember that Apoc is explicitly noted in the rules as NOT being a competitive game. If you're playing Apoc primarily to win, then it's not the game for you. What a grind, though! Did you decide ahead of time to play 6 turns, or did you go the Apoc way and play the game for X amount of time? Honestly, 1 hour per turn is very quick with only one person on each side playing. You guys were VERY efficient. I dont understand what you were saying that 'In Apocalypse, units arriving from reserve can Deepstrike, Outflank or move on from the board edge and you don't have to declare which at the start of the battle. Couple Outflanking with the Scout move and the Ravenwing would be a very dangerous foe to face. So I had to effectively make James go first so I would know when and where his Ravenwing would arrive, while maximising as my railguns to take out his razorback transports on Turn 1. Apoc is no diff. from a normal game, unless they are using Flank March. Oh well, I'll know for the future and I'll educate James about this too!